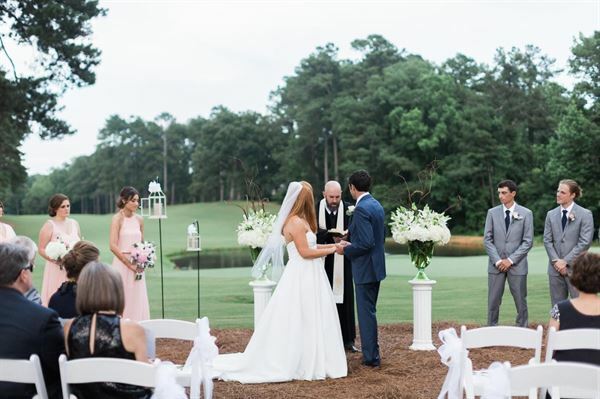 Nestled on 700 acres of unspoiled woodlands, West Lake Country Club in Augusta offers an idyllic setting for weddings and receptions. Say “I do” alongside panoramic views of the 18th green on our lushly landscaped course bordered by classic Southern foliage. And guests will have plenty of room to relax and enjoy your special day using as much or as little of our nearly 5,000 square feet of entertaining space. Enhance your special occasion with fresh and innovative cuisine that is a delight to your senses. Our club boasts award-winning chefs who will work with you to plan an array of culinary delights to compliment your personal style and taste. Our experienced team will cover every detail from hors d'oeuvres to a multi-course banquet, leaving you to savor the fare while relishing the company of your guests. This tastefully decorated board room is appointed with one large boardroom-style table that seats up to 16 people. It is a private room in the front of the clubhouse near the lobby area. Enjoy a most elegant atmosphere for up to 150 guests at round tables, or 200 guests in comfortable theater-style seating. St. Andrews Ballroom, sophisticated Southern hospitality. Troon is an intimate room with an Old World flair for up to 30 seated guests. With its original floor-to-ceiling paneling, a fireplace, and a bay window, Troon is an ideal place to host small meetings or parties, while furnishings can be customized to create the perfect setting for your next gathering or event. Planning on the grandest scale requires nothing but the best of everything at West Lake. Our newest Grand Ballroom offers seating for up to 250 at round tables or a spacious reception for more than 300 guests. Grand Ballroom, beyond expectations. Our family friendly atmosphere, comfortable chairs, classic wood-paneled walls and indoor/outdoor seating options are a just a few of the reasons the West Lake Grille is everyone's favorite place to dine for breakfast, lunch or dinners. Stop in for light fare before or after a round of golf, toast the athletic victories of the day with celebratory beverages or bring the family for dinner. West Lake Grille, casual dining for all ages.